It is no mean task to find a moneylender for a financially risky project. More so, if it is a high-investment, low-return project under the ambitious Jawaharlal Nehru National Solar Mission. The fact that government did not plan finance for a mission that aims to address the challenges of climate change, was laid bare when banks started hesitating to fund it. The three-phase solar mission, that aims to generate 1,100 MW in its first phase, is divided into four schemes. It is the three solar photovoltaic schemes that are in trouble as the small project proponents are not finding financiers. When the first batch of 30 entrepreneurs, chosen to produce 150 MW, set out to find financiers, bankers expressed lack of interest fearing the entrepreneurs may not be able to return the loans. This batch will contribute only to the first part of the 450 MW solar photovoltaic scheme. The 30 entrepreneurs have just about five months to arrange finance. Within a year, 30 more investors would be looking for finance for the next batch of 150 MW generation, and another 50 for the rooftop photovoltaic scheme. But government has not made any plan for them yet. Government has tried to cover up its folly by extending financial closure deadlines for the rooftop photovoltaic generation scheme and the 16 projects that migrated to the solar mission. Earlier, finance for the rooftop photovoltaic generation scheme was to be arranged within six months of registration and the plant was to be commissioned in another six months. Now entrepreneurs get a year to commission a plant with no financial closure deadline and a grace period of six months. Deadline for the 16 investors, who migrated to the solar mission, was also extended by a month to mid-February so that they could complete paper work. Most of these entrepreneurs managed finance because of their association with big companies that flaunt strong balancesheets. Those with no backing got help from government agencies. But extension of deadlines is too little for the huge solar mission. While entrepreneurs fear their projects may not see light of the day and the mission may collapse, a crisis seems inevitable by the third phase, which targets 20,000 MW power generation by 2020. 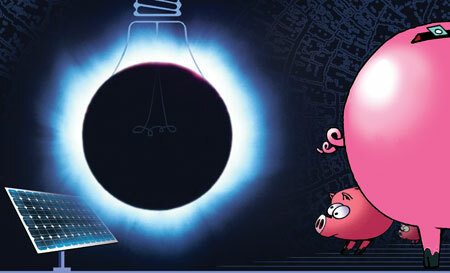 Solar energy generation is 10 times costlier than the conventional coal-based power generation. According to the Central Electricity Regulation Commission, the cost of setting up each megawatt of solar plant is Rs 17 crore, nearly thrice that of a coal-based plant. Revenue generation is just one fifth. A 5-MW coal-based plant, for instance, may sell about 80,000 units of power in a day. But a 5-MW solar plant will produce only about 15,000 units per day. The per-unit cost of solar energy generation, thus, works out to be Rs 17.91. During the bidding process, investors offered 35 per cent discount on Rs 17.91 as tariff. Government faulted by not fixing a base price for the biddings. The huge discount is unviable. (see ‘Bidding exposes solar tariff game’, Down To Earth, December 16-31, 2010). This is the biggest problem affecting entrepreneurs, said Rakesh Singhal, chief manager, State Bank of India Consultancy Services Cell. “Revenue model is not strong right now. Banks cannot be sure if they will get their money back at these tariffs,” he added. Banks require sound location-specific data of solar radiation to assess viability while giving loans. “For a financier, the challenge lies in sourcing reliable historical data to calculate ground radiation with precision. For each location and each state, forecasting is crucial to predict generation of solar power,” said Pranav Sinha of Climate-Parliament, a Delhi-based non-profit. A fund of about Rs 3,000 crore was announced in the Union Budget (2010-11) for research and innovative projects in clean energy technologies. The National Clean Energy Fund is expected to lead to technological breakthroughs that can reduce the capital cost and improve output of solar power plant. But the finance ministry has not issued the guidelines yet. A technological breakthrough is essential because as per the climate change action plan, the solar mission must bring the cost of solar power at par with cheap coal by 2015. Also, 15 per cent of the energy produced in India by 2020 must constitute renewable energy. Sinha has collated a list of banks’ concerns discussed at a workshop organised to find ways to arrange finance for solar mission projects. Banks have demanded an atlas for India to identify how much power a plant can generate under specific weather conditions and locations throughout the year. “There is no way to assess the risk as there is no precedence of successful profitable application. Compared to conventional power projects that have surety of return, the nature of solar projects is uncertain. That is why most private banks are not forthcoming in financing solar power projects,” said an investment expert of a private bank, requesting not to be named. In India, banks give loans only if the project’s payback period is a maximum of 10 years. This may not be feasible for entrepreneurs because they require the assistance for a minimum of 11 years to make ventures viable as the life of a solar plant is 25 years. Moreover, the Reserve Bank of India (RBI) specifies norms on the minimum amount of cash available with a company at any time to pay instalments on loans. But bankers do not see solar power producers meeting the norm. The Ministry of New and Renewable Energy (MNRE) has announced a dedicated fund of Rs 330 crore that will ensure payment of loan instalments even if entrepreneurs default. The Solar Payment Security Fund will ensure uninterrupted payment to banks, said a senior MNRE official. Solar power developers have contracted the NTPC Vidyut Vyapar Nigam Ltd under the mission. But this fund still awaits cabinet’s approval. A ray of hope comes from the RBI. “Banks may get encouraged if RBI gives solar project a priority sector lending status,” said a representative of a major private bank requesting anonymity. In reply to an e-mailed query, RBI spokesperson said the Central bank may give priority lending status to grid-connected solar power projects. But while RBI is working on it, financiers have reason to worry because of government’s past records of repayment of loan amounts. “Our experience shows it is difficult to rely on government- funded schemes because bills are not cleared on time,” he said. Lack of help in India has led some investors to seek international support. World Bank’s arm International Finance Corporation has pledged US $300 million for development of renewable energy projects in India. A quarter of this amount is for the solar energy sector. “Two solar energy firms are in the process of getting into joint ventures with US energy companies to get finance. Financiers like US Exim may promote companies that have joint ventures with US companies by providing finance,” a solar power producer said. The bigger issue as I see is that the future lending may become even more difficult with the rates having gone down so low and these effectively becoming the starting points or benchmarks for the next round of bidding. Is that right or the MNRE will reset the tariff cap based on market knowledge such as the reduced cost of the plant? As per the typical learning curves, Kedar is right, these prices will become benchmarks. Let's be optimistic and hope technology and finance both become supportive going forward, else the mission will only be a dream.